There is a common trope which has been going round for years that there are a series of chalk-marks used by burglars to indicate possible targets. Is your home about to be burgled? The questions is, has there ever been a verified case of a burglar admitting to the use of these codes? Either in actually marking the location of a property themselves, or seeing the code already marked and using that information to choose the target of a burglary? Many news stories quote the "Surrey Police" in the UK. But even a search on their website brings back nothing significant. This is not actually an answer to the question you asked. However, I hope you'll find it useful anyway, since it's quite hard to prove a negative. Another linked BBC News article, "What do those squiggles on the pavement actually mean?," has some more examples of utility road markings. It confirms the water pipe symbol (an "X") and the lamp-post symbol (a circle with an "X" in it), and describes similar symbols for cables. Unfortunately, I haven't found any independent confirmation of the meaning of the "kerb repair required," "potential movement of manhole/cover," and "drop kerb to be installed here" signs. There is also a relevant Snopes article, "Grab and Go Code Chalkers", which gives the verdict "Unproven". *The "South Worcestershire Cops" Facebook account seems to be legitimate, as the West Mercia Police have an officially verified Facebook account which links to one of its posts. loosly translating from this Swedish article "Pär Cederholm (local police chief) also tells us that he has seen gang marking apartments that they then break into. " and here a Swedish insurance company says that "It may happen that they mark the places where they find something interesting." in relation the motor boat motors theft. Is this good proof ? to me it looks more anecdotal, and many times it strongly suffers from confirmation biased. My neighbors (true story) saw a small pile of stones in their yard, others saw a stone lying under the car's wheel, they removed it and whala nothing was stolen. 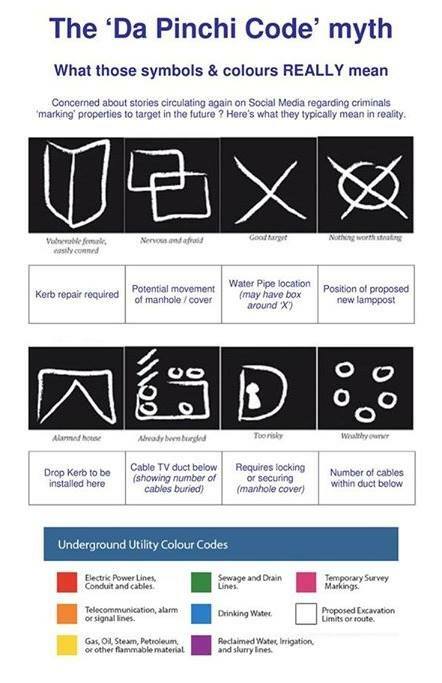 Does the “chalk code” exist?